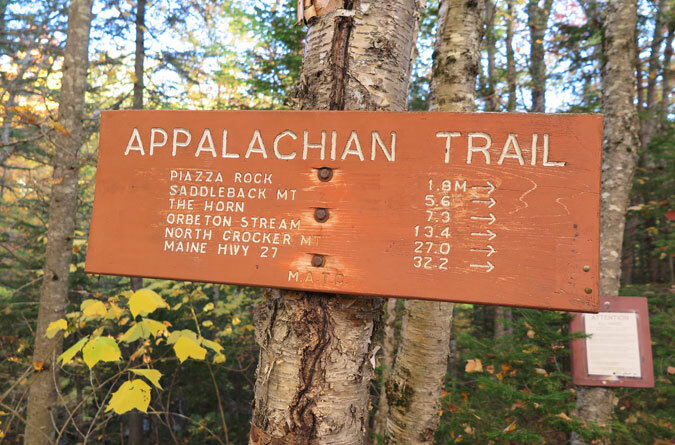 Anyone looking to get a taste of hiking the Appalachian Trail in Maine will find a full-course AT meal on the Route 4 ascent of Saddleback Mountain. 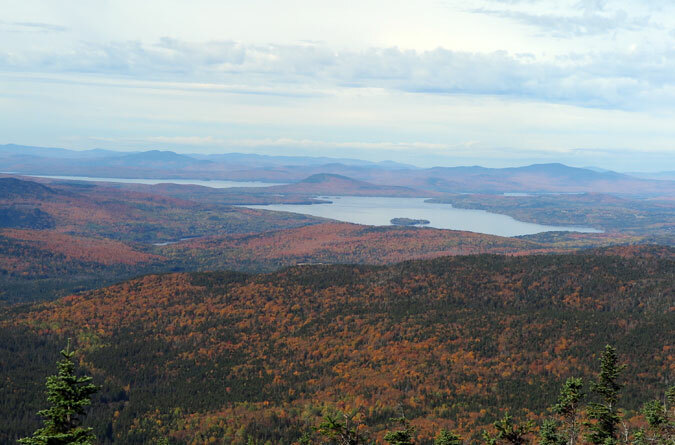 Add a dash of fall in October, and the lush forest, side dishes such as Piazza Rock and Eddy Pond, above-treeline climbing, and open vistas of the Rangeley Lakes Region will satiate the heartiest of AT appetites. Just make sure you leave room for dessert: a mostly open ridge hike to The Horn. 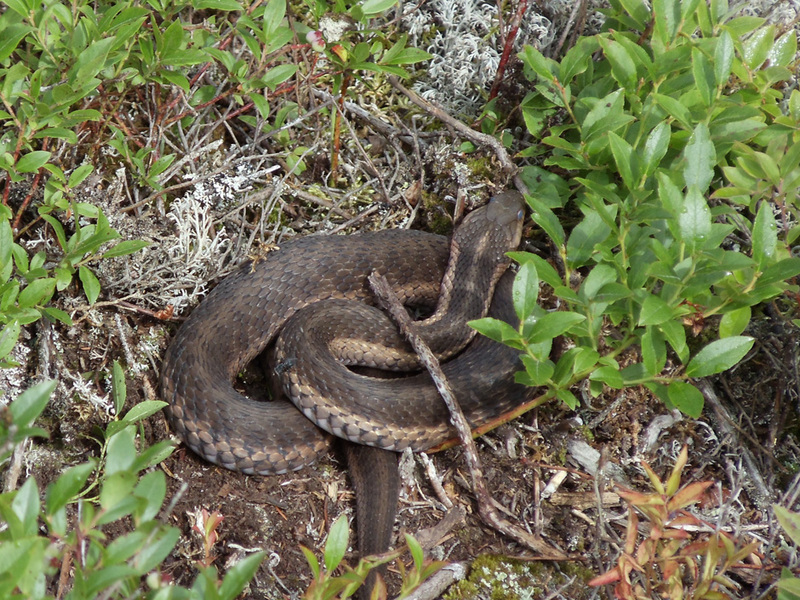 Note: you might also be interested in hiking Saddleback via the Berry Picker’s Trail. Saddleback Mountain during peak foliage is one of those hikes where I simply couldn’t get out of the car fast enough. 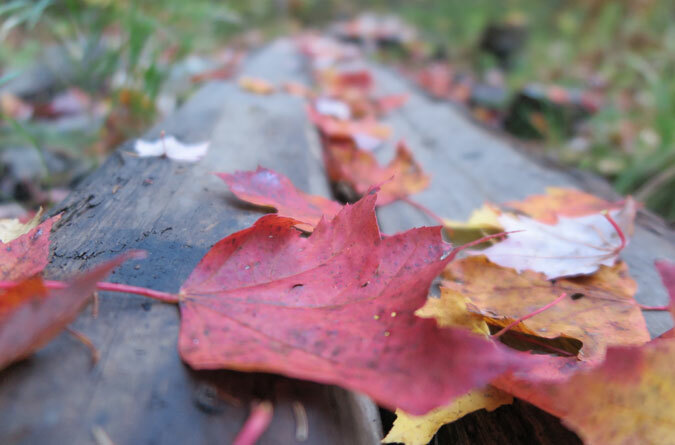 A quick nod to an AT hiker who was making breakfast out of the back of his vehicle in the parking lot, and I scrambled across Route 4 and set out on the Appalachian Trail under a canopy of fall leaves. 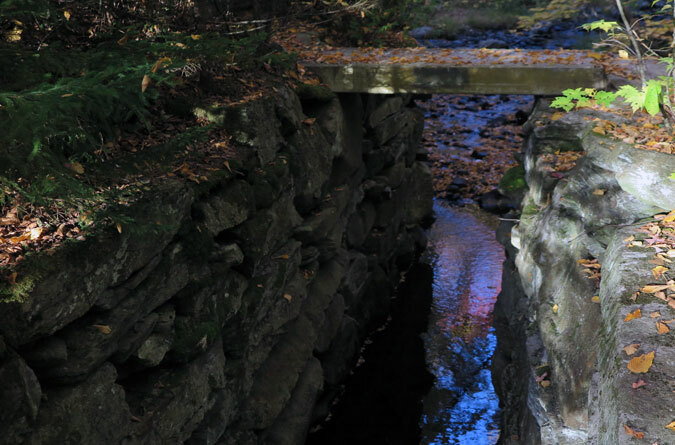 The hike begins with a short descent to Sandy River, more of a small stream at this time of year, the pool of water under the bridge reflecting shades of purple. 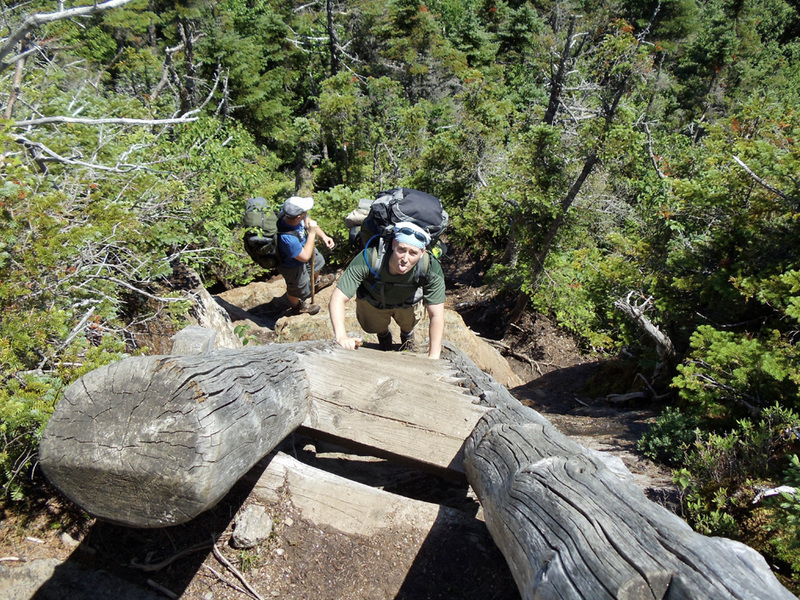 The footbridge crossing of Sandy River on the Appalachian Trail’s ascent of Saddleback Mountain. 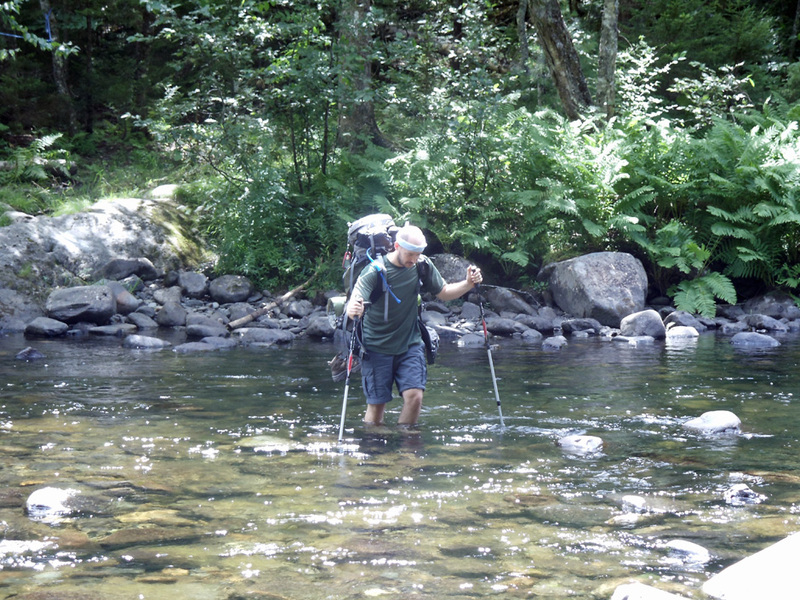 The Appalachian Trail northbound climbs sharply from Sandy River for about a half mile before leveling out and crossing a dirt road. The next mile to the Piazza Rock Lean-To is mostly easy going, passing through a fir tunnel at one junction. 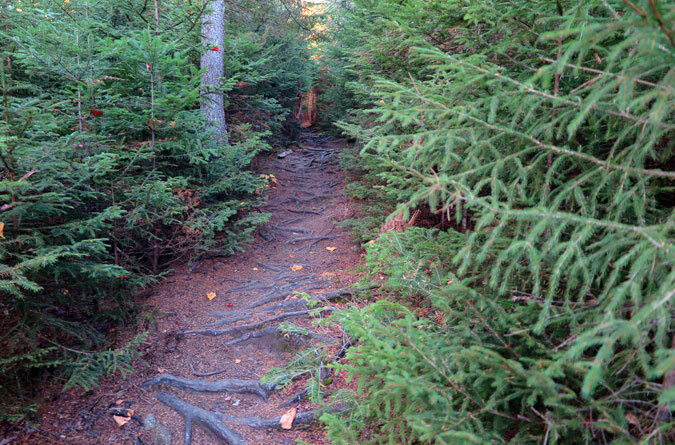 The gnarly, vein-like roots that frequently criss-cross the trail are the only real threat to sure-footing. 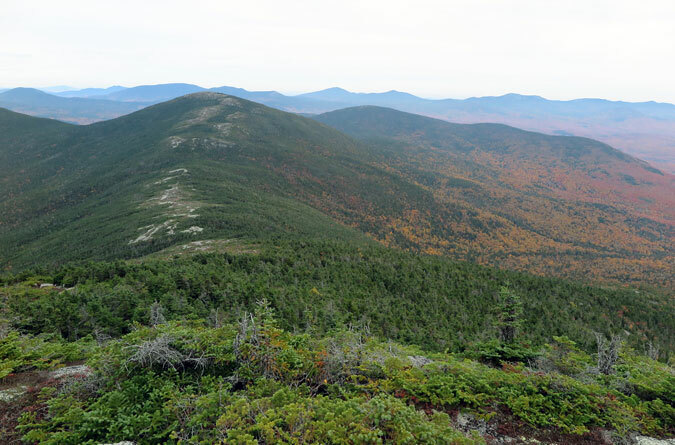 Mid-October on the Appalachian Trail in Maine is prime for leaf-peeping. The terrain may be easy going here, but the footing doesn’t play nice. Expect no less on the Maine AT. 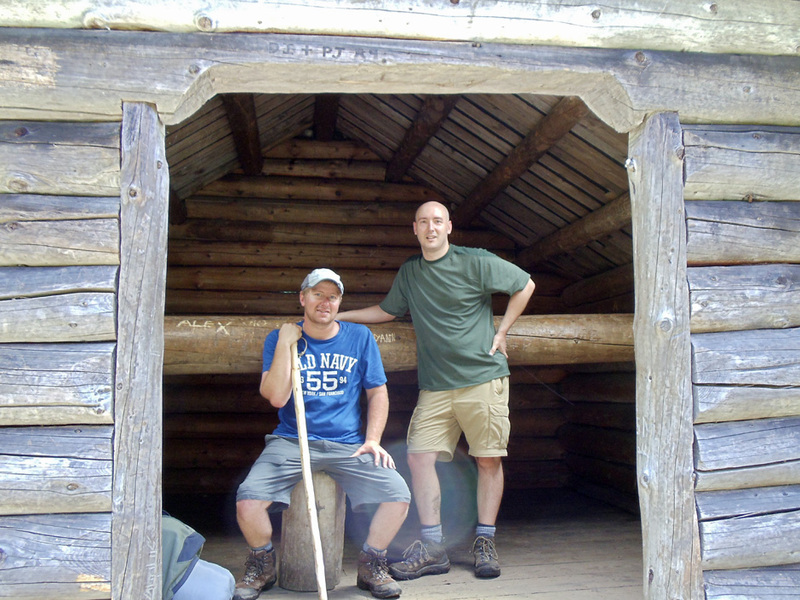 The Piazza Rock Lean-To (caretaker and fee in the summer) is located at a stream crossing and includes tent platforms. 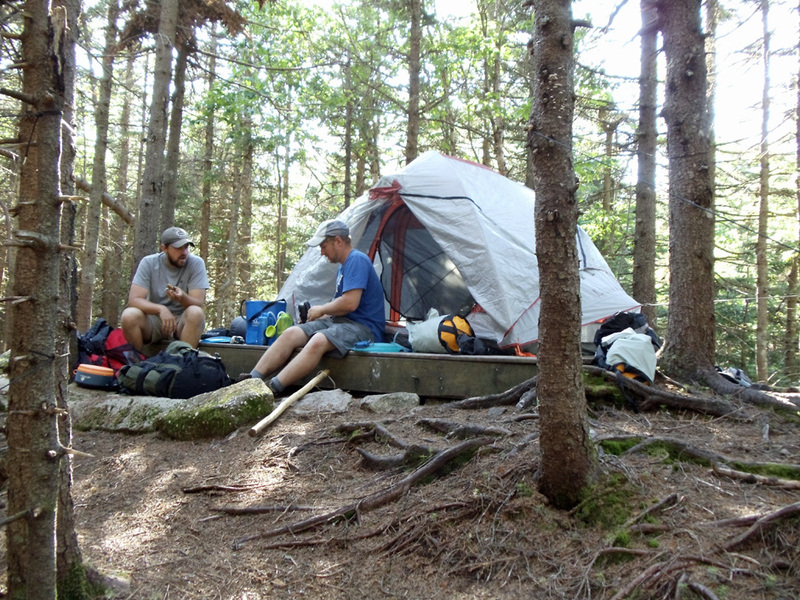 Due to the campsite’s proximity to Route 4 and Rangeley, it gets less thru-hiker traffic than other sites, making it more of a haven for weekend warriors. Access Piazza Rock via a short side trail. 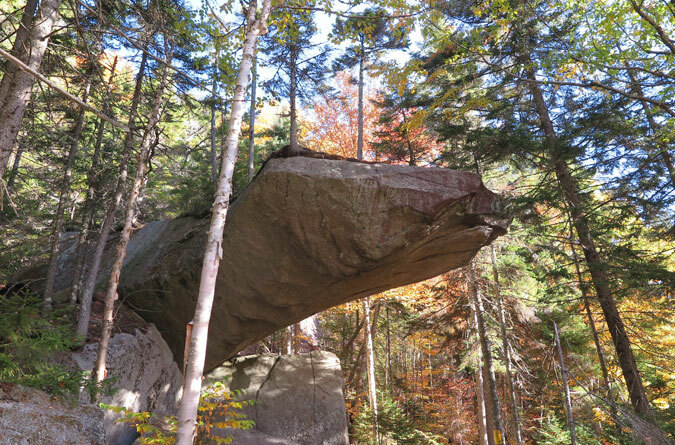 This massive boulder with a flat top protrudes horizontally from the cliff and has interesting caves and rock climbs beneath. 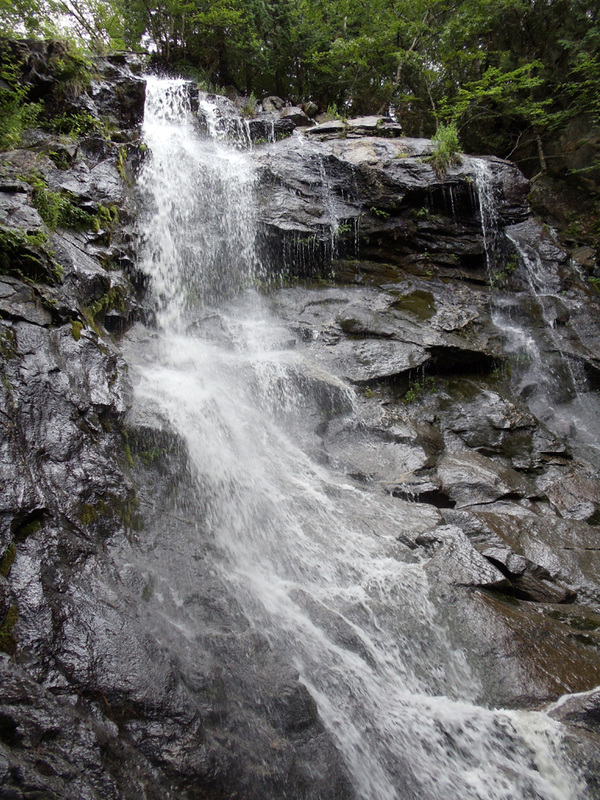 A mere 0.2 miles north of Piazza Rock is another side trail to a series of boulder caves. 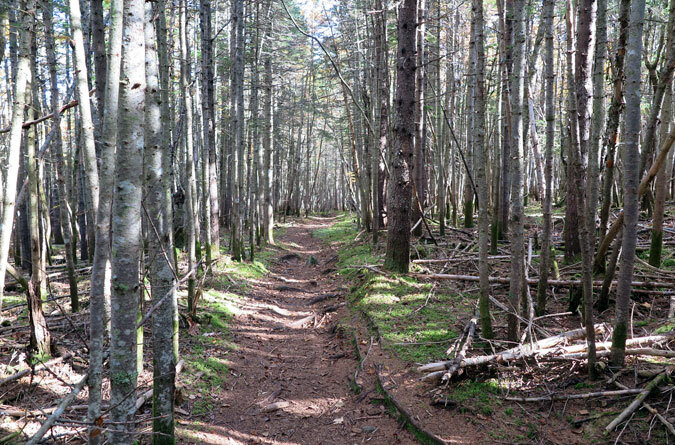 The Appalachian Trail then cuts through a hollow filled with old maple trees glowing with color in the sunlight. A short climb follows the hardwoods. The trail then skirts around Ethel Pond. Ethel Pond wouldn’t be my first choice for a drink, but let’s be serious, it’s not the worst place I’ve filtered water. Either way, it’s good for a gander. 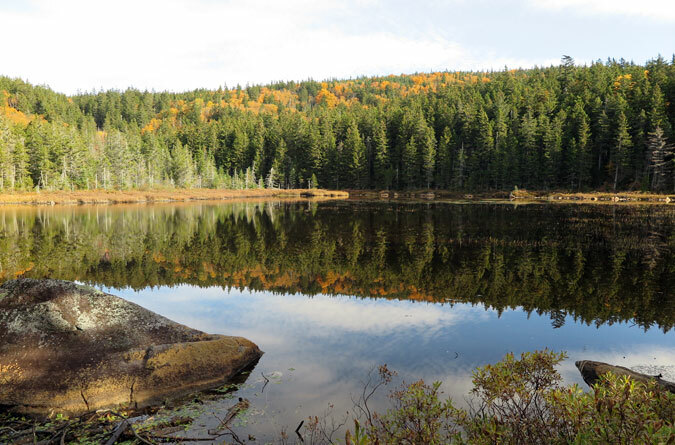 A moderate climb follows Ethel Pond for the next mile, passing a small bog before circumventing Eddy Pond and crossing a subsequent woods road/ATV trail. 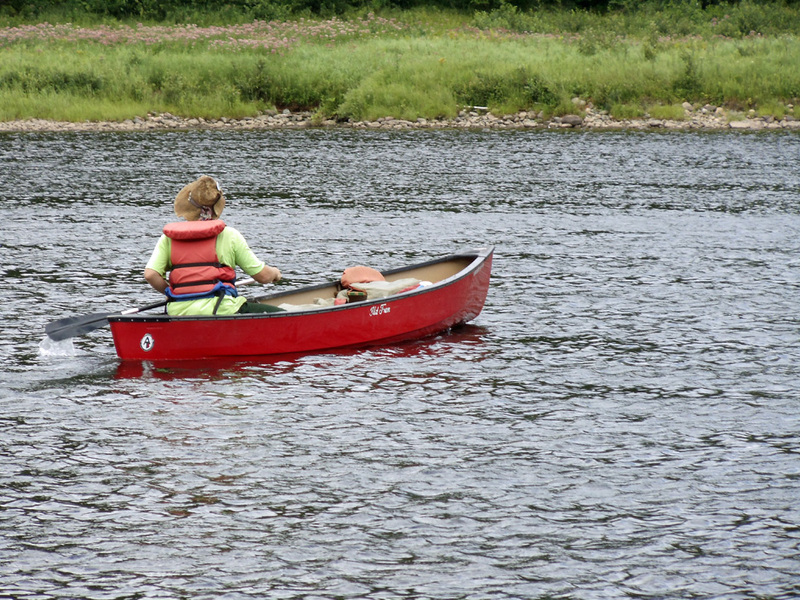 There’s a small boat launch area that goes from the road to the pond, which makes for a good picnic spot. 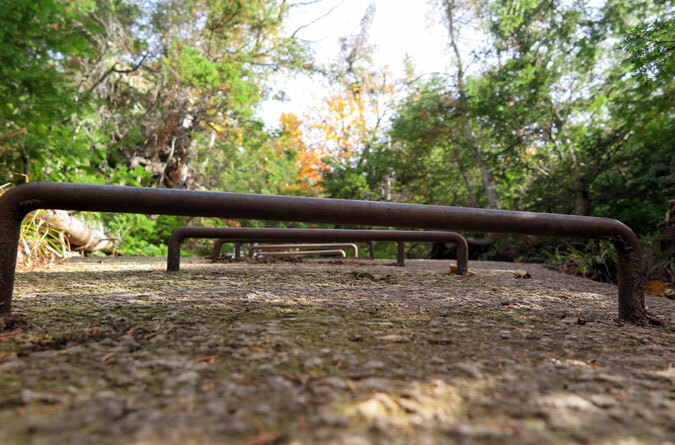 It also appears as though this area serves as a stealth camping spot for thru-hikers. A fun stretch of forest between Ethel and Eddy ponds. 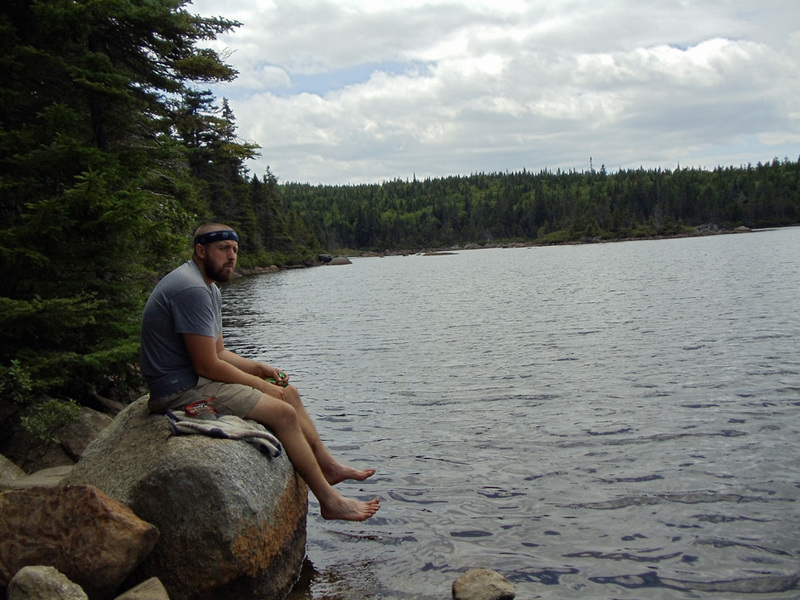 Eddy Pond is a good place to take a load off if you’re in need of a snack break. 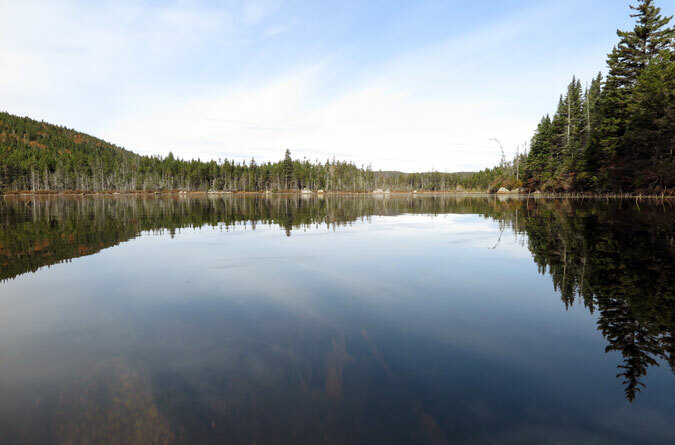 Eddy Pond also marks the spot where the casual hiking ends and the thigh-burning climbing begins. After Eddy Pond, it’s time to burn some calories on the ascent. Fear not, this rung-ladder climb isn’t nearly as steep as depicted in this photo. 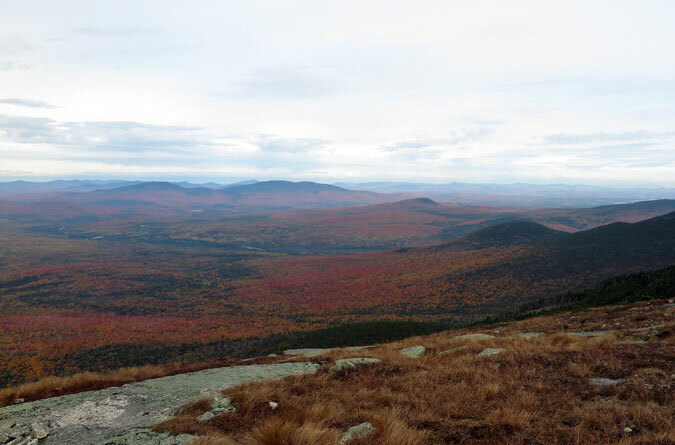 The treeline view of Rangeley Lake from Saddleback Mountain on the Appalachian Trail. Of course, all of the exposed hiking around 4,000 feet also creates a dangerous environment in foul weather, so it’s key to prepare accordingly for both friendly and foe skies. 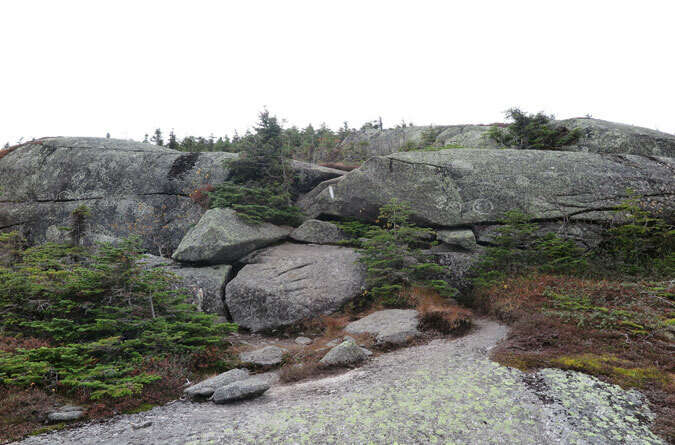 Saddleback Mountain’s exposed bedrock climb on the Appalachian Trail. 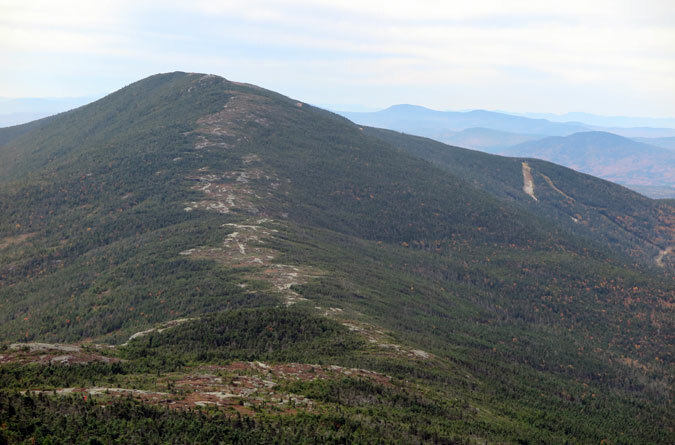 Shortly before the Saddleback summit, the hiking trail from the ski area comes in on the left. 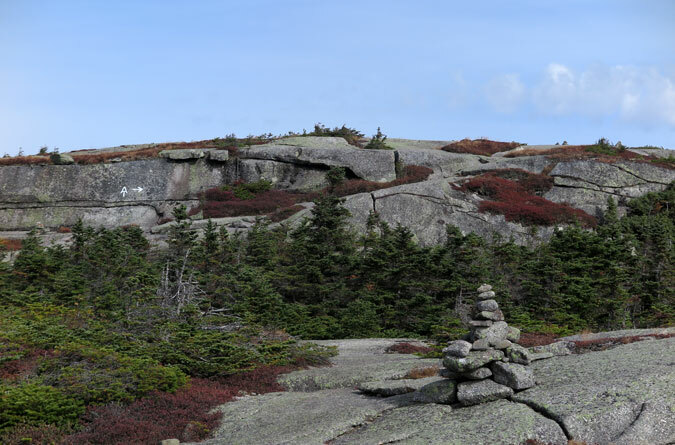 The Saddleback summit, elevation 4,120 feet, features stunning 360-degree views. 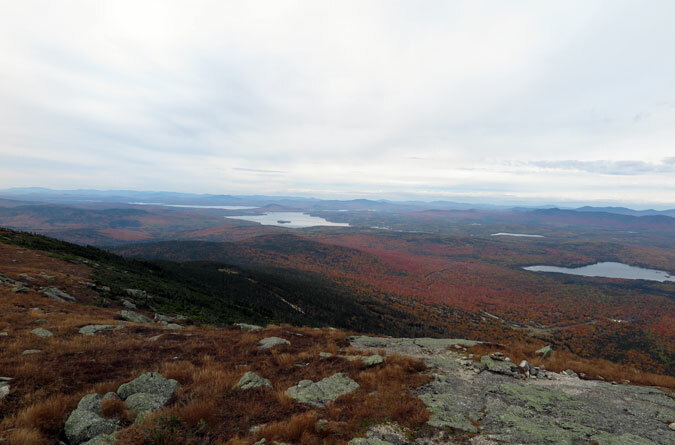 The view toward Rangeley Lake from the Saddleback summit. 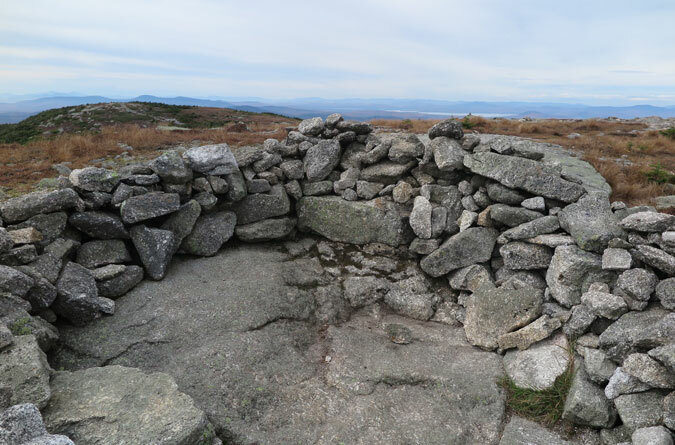 The’s a rock fort on the Saddleback summit that’s a good place to get out of the wind to enjoy a snack. Ready for more hiking? The Horn is calling! The 1.6-mile hike to The Horn descends into the col via a bedrock ledge that can be tricky in winter, re-enters the trees for a short distance, and is then in and out of the krummholz before a moderate but exposed climb to The Horn. The ledges after the Saddleback summit. On the way to The Horn, 0.7 miles south of the Saddleback summit, is the intersection with the Berry Picker’s Trail. 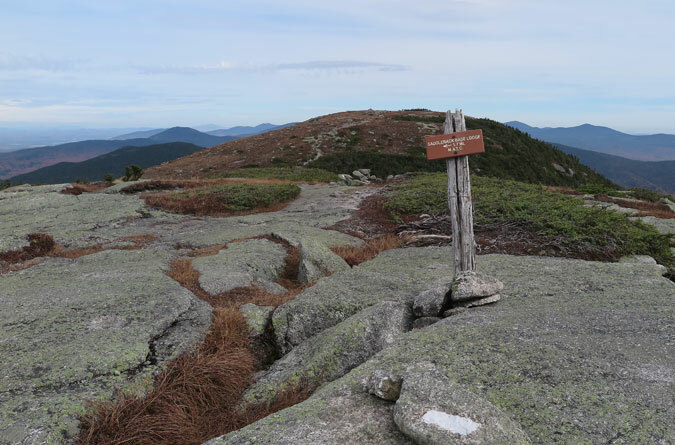 Opened in September of 2016, and created by the Maine Appalachian Club and the Maine Appalachian Land Trust, the Berry Picker’s Trail takes the historic route that locals often used to pick blueberries and cranberries on Saddleback. The northern view of Saddleback Jr. from The Horn. 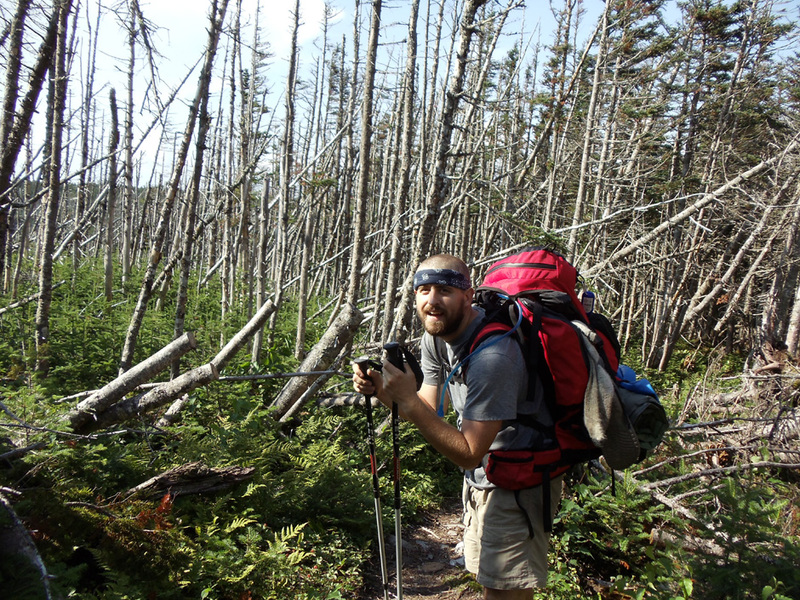 For thru-hikers, it’s another two miles to Junior. 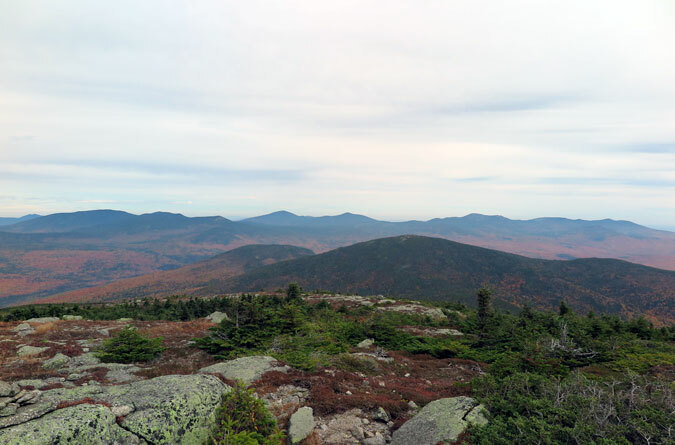 The view of Saddleback Mountain and the Appalachian Trail from The Horn. The upper ski trails are viewable on the right.